Natural gas prices are much in the news. Prices have fallen precipitously in the past few weeks. 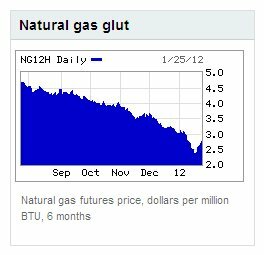 Natural gas futures have fallen 35% in the past year. Warm weather this winter has created a gas glut. In his state of the union address, President Obama said the US now has 100 years of natural gas supply and touted gas as the energy future. Analysts are predicting that prices will continue to fall. Predictions are that natural gas storage capacity will be tested this year. Exploration companies are moving to oil plays and drilling only those gas wells necessary to hold acreage. In many plays, such as the liquids-rich portion of the Eagle Ford, lots of gas is being flared in order to get the liquids to market. That gas will eventually go on line, further increasing supply. Producers in some areas can give the gas away and still make money on the liquids. In the Barnett Shale, gas production continues to increase despite the decline in drilling rigs. Barnett shale production set an all-time high of 5.9 Bcf/day in October 2011, with 2/3rds less drilling activity. Chesapeake, the nation’s second-largest gas producer, recently announced that it is shutting in as much as one Bcf/d of its production – about 16% of its total — until prices improve. Most analysts are revising their price predictions down. But Anadarko predicts that natural gas prices will rise as soon as drilling slows. Electricity prices are falling – good for consumers, not so good for power producers. Prices of fertilizer and plastics are also falling. More electric power plants are switching from coal to gas, and coal plants on the drawing board are being reconsidered. Over the past decade, electricity from gas-fired plants has increased by 50 percent, while coal-fired electric generation has declined. Gas-fired power plants are cheaper to build and easier to get permitted. They are also easier to turn on and off, as electricity demand fluctuates. The power industry is beginning to have some confidence in the domestic gas supply. Export of excess supplies of U.S. natural gas are being discussed and planned. Low gas prices have dampened enthusiasm for nuclear power plants and generation from wind and solar. The cost, including construction, to generate one megawatt hour of gas-fueled electricity is now less than that for coal, wind and solar, according to Bloomberg. But Energy Secretary Steven Chu says that the alternative energy industry can benefit from low gas prices. Because of gas generating plants’ ability to “swing” in output, it should be easier for wind and solar generation to sell into the market when they are able to provide generating capacity. Cheap gas has caused owners of a methanol plant in Chile to consider moving a methanol plant to Louisiana. Natural gas is the feedstock for methanol. To take advantage of low gas prices, the Texas Commission on Environmental Quality is offering $4.5 million in grants to build natural gas fueling stations, to encourage use of natural gas in the transportation sector. Meanwhile, the debate over the safety of hydraulic fracturing continues. One report says that state agencies who have traditionally regulated the oil and gas exploration industry are tightening their regulations to avoid a takeover of their responsibilities by the EPA. And, the debate continues (at least in Ithaca NY) over whether burning natural gas in fact has less of a global warming impact than coal.